Over the past decade and a half, India has witnessed exponential growth in the telecom sector. The current mobile phone population is as high as 95+ crores. In fact, a number of cell phones we add every month is higher than the entire population of a country like Norway. This growth is predominant in the urban environment where the per capita mobile population in urban- India is 145%, which means EVERY person has ONE mobile and every SECOND person has TWO mobiles. To keep pace with this growth, mobile operators also have to constantly expand their networks, causing analogous growth in mobile towers. Quite a few of these towers do even host multiple operators and multiple technologies like 2G, 2.5G, 3G, etc., which would eventually result in higher radiation and more hardware components & complexity. Our city landscape is plagued with steel-fabricated bulky mobile towers, which raise aesthetic as well as perceived health concerns. In spite of these, operators still fall short in providing adequate signal quality and lesser call drops. Reliance Jio has decided to take this challenge – head on. With its revolutionary & innovative small cell technology, Reliance Jio is all set to redefine the mobile connectivity landscape and thereby adding value to mobile-India and society at large. Small cell, as the name implies, is a miniature version of the inelegant conventional mobile towers (BTS). In fact, small cell is so small that it looks more like a residential Wi-Fi router. 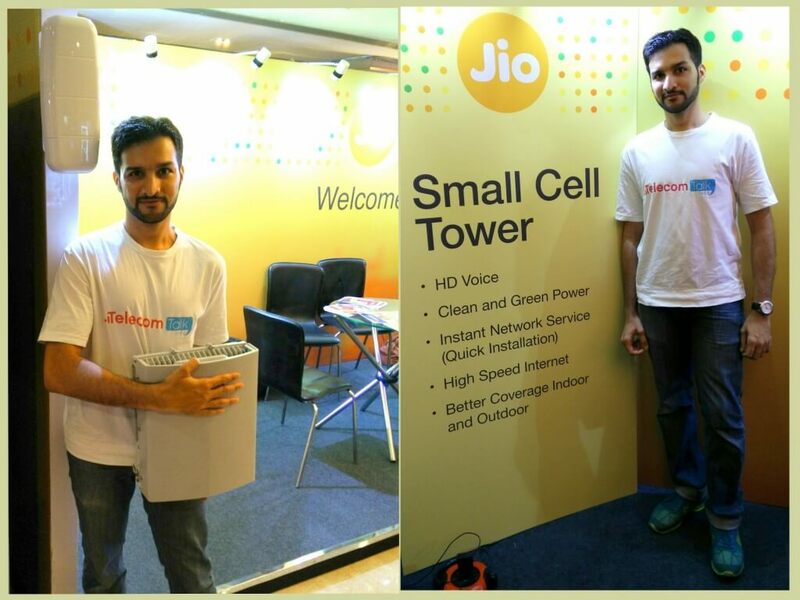 No area is out of reach for these small cells and can be deployed in every nook & corner. Without being an eye-sore, these compact good-looking boxes can be easily deployed virtually anywhere, including shafts, staircases, Lift Coverage, lobbies, rooftops, lampposts, etc. In the photo above, the device I am holding in my hands is the outdoor small cell unit with a coverage of 2 Kilometres and the device to my top right is the indoor small cell unit with a range of approximately 500 metres. High-speed data requirement arises from inside the premises at most of the locations & with conventional bulky tower system it is always challenging to provide the 100% coverage penetration inside the building. To provide the ubiquitous coverage inside, Indoor Small Cell is one of the best solutions which not only provides Coverage, Speed & Quality but enhances the network capacity as well. These are of utmost use to small medium enterprises (SMEs) and large corporate offices inside thick walled commercial complexes. In conclusion, Reliance Jio’s small cell would have the user-proximity and thereby would provide superior coverage & enhanced capacity, both in the indoor & outdoor environment. This phenomenon would result in diminishing call drops and recognizable improvement in network quality leading to uninterrupted services. Moreover, these small cells would also positively impact the urban landscape in achieving the reduction in the number of those huge mobile towers.